This morning I received and unexpected gift from terry 1954. My pleasant surprise was the One Lovely Blog Award! Thank you, terry1954 for sharing the award with me and supporting my blog. I truly appreciate your kindness. 1. Ketchup is not my friend. 2. I can never find any really cute shoes, because I have giant feet. 3. My patio table is made out of scrap wood. 4. A visit to Europe is on my bucket list. 5. The fastest speed I ever traveled was 116 MPH on the back of a motorcycle. It was exhilarating, and I was very young! 6. Even though I have taken two Spanish classes in my life and passed, I learned more Spanish from Sesame Street. Agua any one? It is too Caliente in here. 7. During summer vacation, Mondays lose their meaning to me. Posted in Awards and tagged accolade, accomplishment, awards, blog, blogging, encouragement, Grandmother Musings, honor, nomination, One Lovely Blog Award, postaday, recognition, recommendation, terry1954, writing. Bookmark the permalink. Hi, thank you so much, I am blown away by this! It really is a great feeling to be nominated! Well I’ll keep my fingers, toes and eyes crossed as I wait and see what happens! Thank you for supporting my writing as well, it means everything! Again thank you, you made my day! 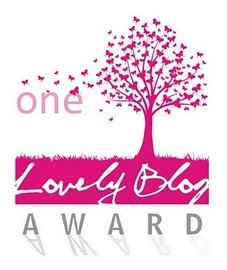 One Lovely Blog Award for one lovely lady. I love that you won this award and passed it on, just last week, I was in Ireland with my 10 year old daughter spending time with my Grandmother (her great Grandmother) Kathleen who is fit and well at 85 years and it being my daughters first visit to Ireland, after a couple of days she asked me “Why does everyone in this country always say ‘lovely’?” And indeed it is true, they are lovely, friendly, hospitable people and lovely is one of their favourite expressions. Congratulations on your award! You deserve it! Thank you for the nomination. I’ll put my nominees up in a few days. CONGRATULATIONS! You have one lovely blog. Congratulations, Jamie! A great post, a lovely blog, and a wise woman–a nice combination, especially for a (non-vacation) Monday. Thank you so much for the nomination, as well. I am so honored to receive it from you! Congratulations! Your blog is wonderful and the award is well deserved. i hope you are enjoying your award!! !